Pure Encapsulations is recognized as an industry leader in the development and manufacture of science-based, hypoallergenic high quality supplements. Pure Encapsulations is dedicated to advancing the research and clinical applications of dietary supplements in the areas of metabolic, cardiovascular, neurological and cognitive health. Their ongoing involvement in current research and clinical trials supports an effort to identify cellular targets and mechanisms that influence health at the genomic level. Their formulations are designed to provide strengths and dosages consistent with clinical experience to optimize the long-term health of even the most sensitive patients. 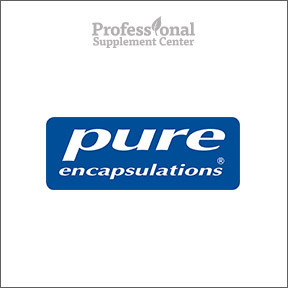 Pure Encapsulations ensures that their products contain the highest quality ingredients in their most bioavailable forms. Their extensive 3rd party product testing program includes verification of purity, potency and identity. Full label disclosure ensures products are free of common allergens, binders, excipients and GMO ingredients. Pure Encapsulations® clinically relevant professional formulations are available solely through qualified healthcare professionals. Magnesium (glycinate) – This popular, 5 star-rated product provides highly bioavailable magnesium chelate along with vitamin C in support of the proper functioning of many important enzymatic and physiological functions, including nutrient and energy metabolism, cardiovascular support and muscle function. Gluten and soy free, Non-GMO vegetarian formulation. Nutrient 950® without Iron – This complete hypoallergenic, nutrient rich formula provides highly bioavailable, activated vitamins, fully chelated minerals, trace elements and cofactors for optimal nutritional support of all body systems. This gentle, well tolerated formula provides a high profile of antioxidants important for cardiovascular, immune and cellular health. Gluten and soy free, Non-GMO vegetarian formulation. Digestive Enzymes Ultra – This all encompassing, high-strength blend of vegetarian enzymes supports enhanced protein, carbohydrate, fat, fiber and dairy digestion, promoting optimal nutrient bioavailability and absorption and relieving occasional bloating and gas. Gluten and soy free, Non-GMO vegetarian formulation. This entry was posted in Home and tagged Digestive Enzymes Ultra, Magnesium glycinate, Nutrient 950® without Iron, Professional Supplement Center, Pure Encapsulations, Vitamins and supplements, www.professionalsupplementcenter.com. Bookmark the permalink.